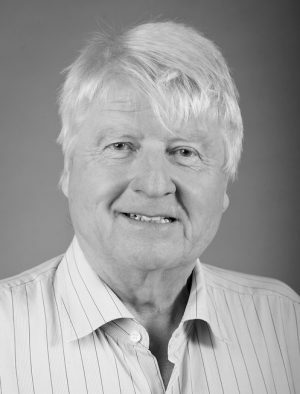 Stanley Johnson was born in Cornwall in August 1940 and educated at Ravenswood School, near Tiverton, Devon; Sherborne School, Dorset; and Exeter College, Oxford, where he won a Stapeldon Scholarship in Classics. Since 1951, his family has farmed on Exmoor, on the Devon-Somerset border, and Stanley still manages the farm there today. Stanley was awarded a Harkness Fellowship to the United States in 1963. He is a former Conservative Member of the European Parliament (MEP) where he served (1979-1984) as Vice Chairman of the Parliament’s Committee on Environment, Public Health and Consumer Protection. He has also worked in the European Commission (1973-1979) as Head of the Prevention of Pollution division and (1984-1994) as Senior Adviser to DG Environment and as Director of Energy Policy. Before joining the Commission, Stanley served on the staff of the World Bank and the International Planned Parenthood Federation. Stanley has been an adviser to Price Waterhouse Coopers; a director of ERM, an environmental consultancy; a trustee of the Earthwatch Institute and Plantlife International; and an environmental adviser to Jupiter Asset Management. He is currently a trustee of the Gorilla Organisation (www.gorillas.org) and an Ambassador for the United Nations Convention on Migratory Species (CMS) (www.cms.int). He has had ten books published dealing with the Polar Regions and environmental issues, including Antarctica: The Last Great Wilderness; Icecap; The Politics of Environment; The Earth Summit; The Environmental Policy of the European Communities; and UNEP The First 40 Years. He has also had nine novels published, including The Commissioner which was made into a film starring John Hurt. In 1984, he was awarded the Greenpeace Prize for Outstanding Services to the Environment and, in the same year, the RSPCA Richard Martin award for services to animal welfare. In 1962, he won the Newdigate Prize for Poetry. In 2012, Stanley was awarded the WWF Silver Medal and, in 2015, he received the RSPB’s Medal for Services to Nature Conservation and the WWF Leaders of the Living Planet Award. Stanley has four children by his first marriage to the painter Charlotte Johnson-Wahl: former Mayor of London and current Foreign Secretary Boris Johnson; MP for Orpington and Minister of State for Universities and Science Joseph Johnson; British editor, journalist and author Rachel Johnson; and author and sustainability expert Leo Johnson . He also has two children, Julia and Maximilian, by his second marriage to Jennifer Kidd.